Come and visit us at our Free weekly Saturday afternoon meetings between 1 - 4 pm at the West Bay Cafe, Sea Road, Westgate-on-Sea CT8 8QZ, to join in with this amazing hobby. These meetings are free and open to interested people of all ages. 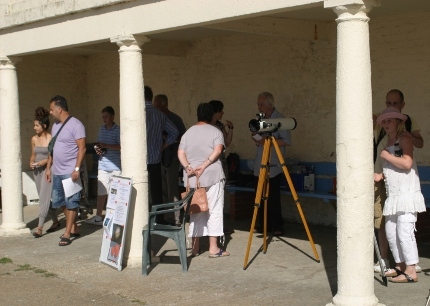 Have a look at the telescopes and have a go, as it's easer to learn in daylight than in the dark. There are loads of interesting targets to practise aligning the telescopes on :- Ships, Wind Farm, Birds, Etc. 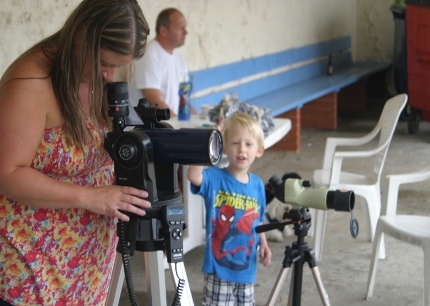 We can show you how to safely observe the Sun on sunny days. (Solar Observation always requires the correct safety procedures, NEVER LOOK DIRECTLY AT THE SUN. Use a primary filter not an eye piece filter or better still, project the image). Please see the Events page for an up to date list of upcoming events. Anyone interested in helping us. Please come and talk to Danny or George at any of our Events.